Meet Gerry Robinson "The Instant Song Maker"
The entertainment on GigMasters doesn't stop on stage -- it continues right here on our phone lines! Our team receives all kinds of crazy calls from our hilarious performers everyday. One particular member who we love to hear from (and makes our day go by a little faster) is our friend, Gerry Robinson. Long before Jimmy Fallon and The Roots started improvising raps for audience members, Mr. Robinson has been serenading party-goers for years. He's known as the “The Instant Song Maker” for his ability to make up songs about you right on the spot. He’ll just ask you a few quick questions (usually involving your relationship status) then he’ll turn around a custom-made song for you within seconds. Gerry Robinson, "Rob and Laurie Song"
If you check out his profile, you’ll see him schmoozing it up with celebrities such as Hugh Hefner, Paula Abdul and Jay Leno. 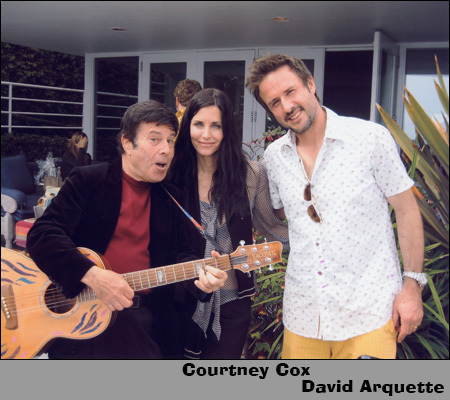 Here's a rare moment with Courtney Cox and David Arquette below. Hopefully, for Gerry's sake, this was pre-breakup! If you’re interested in hiring him for your next party, visit Gerry Robinson’s Profile right here on GigMasters.com.